I've heard that Aussies are more likely to be sensitive to certain foods. Is there an age when these issues arise? My 20 month old pup will itch himself frequently throughout the day, rub his face after eating, and has some eye discharge (he's on lamb and chicken, and gets a fish pill with dinner). Could these be signs of sensitivities, or am I too neurotic? Thanks! 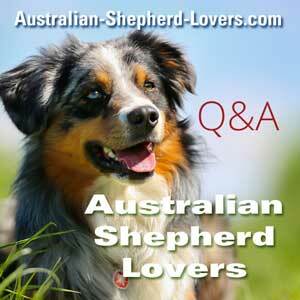 Comments for Australian Shepherd Food Allergies? My Aussie developed an allergy to chicken at a year and a half old. He is on a pork diet now and is fine. He gets herring oil 3 times a week and no issues.